Ok I love sprouts! There, I’ve said it and I feel good about it. Way back when Care and I first got married you could not get sprouts in the store like you can now. It was a treat at the local Asian food restaurant or the slimy canned things from La Choy. So being the 70’s back to basics kinda guy I figured I can start my own garden plants so how hard can it be to sprout a few seeds. The answer was it really is not hard and they are so fresh I always wish I did it more often. So I will post each day of the sprouts cycle for this batch I am doing now. I have no fancy equipment just a set of sprouting lids actually from the 1970’s. They don’t get a lot of abuse so a set could last a life time. These fit a wide mouth canning jar. I have seen the lids at Whole Foods and online at Amazon. There are pros and cons to doing sprouts this way but I only do a small batch and not very often so an investment in major equipment seems silly. This batch is mung beans only. You can sprout a mix, radish, alfalfa, most any seed mix with limits. Seeds can be ordered online, at a store like Whole Foods, or many bulk seeds in the grocery store will work well. 1st thing is to soak the seeds in the jar 12 hours or overnight. 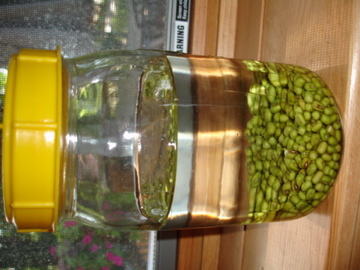 Drain and rinse the seeds 3 times with cold water swirling the water as you drain the jar each time. The mesh of the jar lid keeps the seeds in the jar but allows the water to drain. Be sure the water is completely drained and store the jar tilted mesh side down so any water would continue to drain. You want to have the mesh and the seeds open to the air for circulation. The jar should be stored in a clean, cool relatively dark place not in a window sill. If the seed get too much light they will gain chlorophyll and turn green. This may be desirable later on but not now. So this is Day One the beans are soaking! This entry was posted in General, Sprouts on August 1, 2011 by Kim Galizio. You should be the food editor for the newspapers. Directions are clear and easy to follow. Much better than most. If you have not guessed this is my Mom. Thanks for the compliment and always being there. Isn’t she great!! Very cool I actually had no idea so there was this much of a process involved. I’m excited to see the progress. Very informative and interesting. I love sprouts too.